The private spaceflight company Rocket Lab has picked NASA's Wallops Flight Facility on Wallops Island, Virginia as its U.S. launch site. The company unveiled the decision on Oct. 17, 2018. WALLOPS ISLAND, Virginia — The private spaceflight company Rocket Lab has a new spaceport, and it's in Virginia. The California-based startup Rocket Lab, which aims to corner the small-satellite launch market with its Electron boosters, unveiled plans to launch missions from the Mid-Atlantic Regional Spaceport overseen by Virginia Space. The first mission could fly as early as next year. Rocket Lab will build a new launch pad, called Launch Complex-2 (LC-2 for short), near the Pad 0A site used by Northrop Grumman for Antares launches. Rocket Lab CEO Peter Beck said the first launch is scheduled for the third quarter of 2019. "We're honored to be so warmly welcomed into your beautiful state," Beck said during the unveiling here today (Oct. 17). As its name suggests, LC-2 is Rocket Lab's second launch site, but it's the first one located in the United States. The company has launched two test flights from its primary launch site on New Zealand's Mahia Peninsula. Wallops Flight Facility, on Virginia's Eastern Shore beach region, was one of four spaceports on Rocket Lab's short list for commercial satellite launches from U.S. soil. The other sites were Florida's Cape Canaveral, California's Vandenberg Air Force Base and Alaska's Pacific Spaceport Complex. "We were seeking a site that could be developed quickly and also tailored to meet our needs and [that] could support a flight rate of at least 12 launches a year," Beck said. "I'm very excited to announce that we found that and more at NASA Wallops Flight Facility." The new launchpad will be located near Wallops' seaside Pad 0A, which Northrop Grumman's Antares rockets use. Rocket Lab will reportedly invest $20 million to build the new launch site and will receive a $5 million state grant from Virginia's transportation department. The launch complex will include a pad, an integration facility and a launch control center, and the site will add about 30 jobs to the local economy, Rocket Lab representatives said. "Is this great or what?" Bill Wrobel, director of the Wallops Flight Facility, said during a groundbreaking ceremony. "This is a real shot in the arm for the Eastern Shore." Beck said that one big factor in Wallops' favor is the launch range's availability, because fewer flights launch from the facility than from Cape Canaveral or Vandenberg. Rocket Lab aims to rapidly boost its launch schedule with the addition of LC-2. 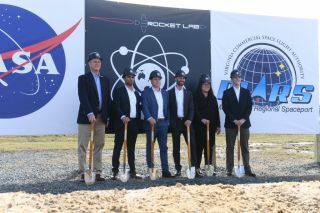 Beck said he sees the Wallops launch site as a "boutique" launchpad for customers who are not able to travel to Rocket Lab's primary launch site, LC-1 in New Zealand. LC-1 is licensed for a launch every 72 hours, and Rocket Lab eventually aims to step up its launch pace to more than 130 launches a year. Rocket Lab's engines are produced at its Huntington Beach, California, headquarters, with the rest of the Electron booster assembled at the company's new rocket factory in Auckland, New Zealand. Electron boosters stand 57 feet (17 meters) tall and are designed to launch payloads of up to 500 lbs. (227 kilograms) into orbit for about $5 million per launch. The company has launched two Electrons so far, a test flight in May of 2017 and a second mission in January of this year. Rocket Lab's next mission, nicknamed "It's Business Time," is scheduled to launch in November after a series of delays. It was originally scheduled to launch in April, but the date then slipped to June and November due to a glitch in a rocket-motor controller among other issues. Beck said that "It's Business Time" is on track for a November launch, adding that the company has spent the last few months ironing out the Electron issues for the long term. "We're not just focused on the next flight," Beck said. "We're focused on the next 100 flights."